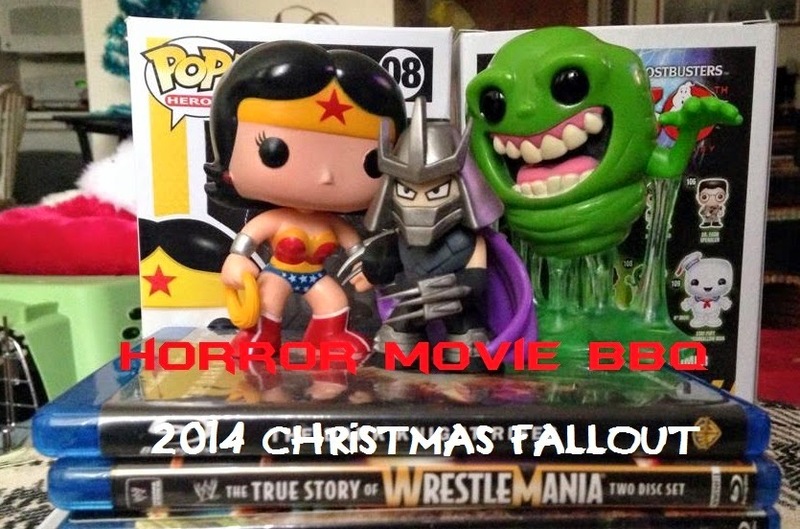 The Horror Movie BBQ: The Horror Movie BBQ 2014 Christmas Fallout! The Horror Movie BBQ 2014 Christmas Fallout! Crap. Christmas has come and gone. I really wish it was still Christmas. Everything just went perfectly and I sincerely hope it was as great for your family as it was mine. So of course while everything went well, the days after Christmas have been kinda depressing. I don't know, I had such a fun Christmas season and it's been a crummy year so I wanted Christmas to last as long as possible. But memories of the great season will last forever. And of course with the generous helping of food, family and fellowship, there's also presents. I'm a pretty easy guy to buy for, as you'll see. I don't know, if I need clothes or tools or electronics, I usually pick it up when I need it. But when it comes to gifts, I usually ask for dvds, blurays and books. This year was really no different. So while I've always wanted to try my hand at these since they always are a fun read over at DinosaurDracula(as well as X-Entertainment) I finally decided to pull the trigger and do my first annual Christmas Fallout. Let's begin, shall we! Good gosh, look at that beautiful stack of movies. I never have to buy movies ever again. 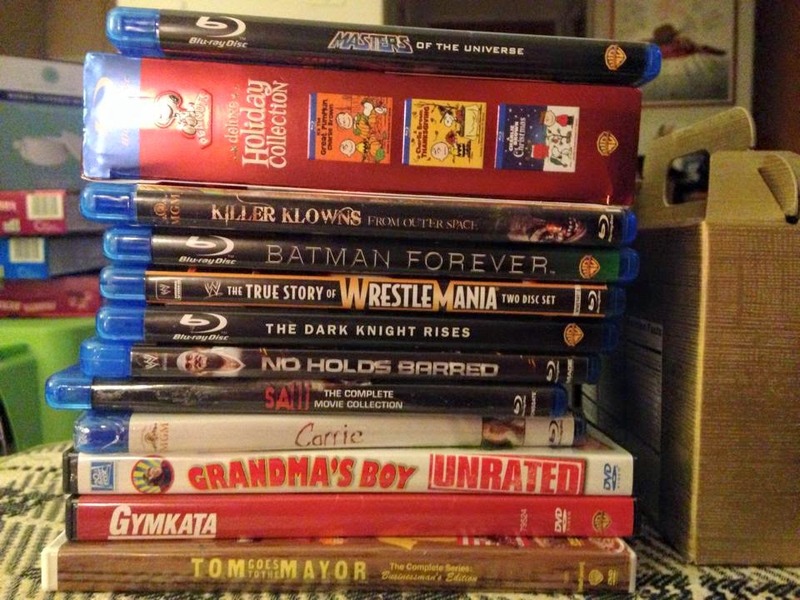 Some wrestling, some horror, two Batman movies, some comedies and the Peanuts Holiday set. If you've ever wondered what my movie shelf looks like, this should give you a great idea. All great movies to add to my collection. Some I've wanted to replace old dvds or vhs, so these will definitely get great use. I'm told more are on the way, as Christmas Vacation on bluray just didn't arrive on time. But that's a movie that I'll be happy to wait for. I also bet that Masters of the Universe bluray will look terrific in hidef. As of late, I've been getting out of the action figure game and diving head first into these Funko Pop! Vinyl figures. For under 10 bucks, I can get an arty bobblehead featuring my favorite pop culture characters. From comic books to horror to WWE to cereal mascots, they have it all. So knowing this, my girlfriend decided to gift me three Pop! figures and a neat Ninja Turtles mystery figure. 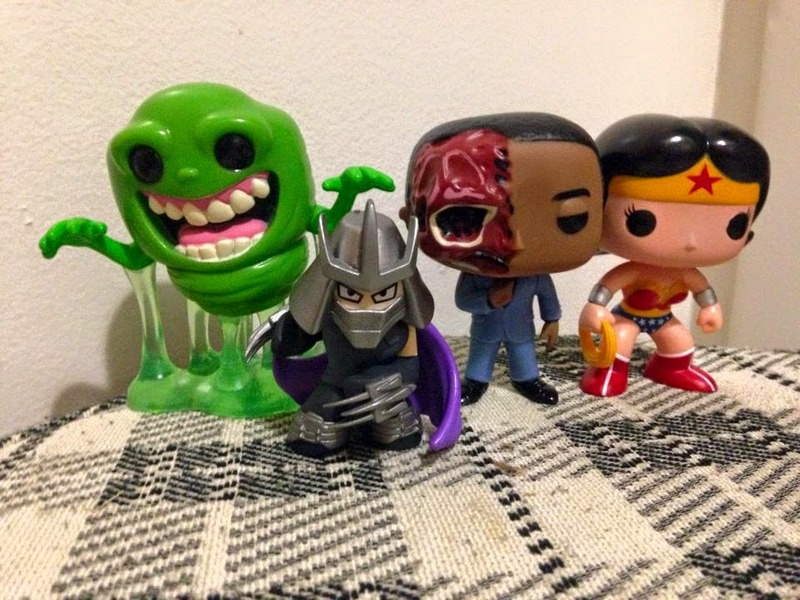 Slimer, Gus from Breaking Bad, and Wonder Woman were added to my growing Pop! collection as well as that awesome vinyl Shredder. These figures are just too awesome. And I firmly believe that's the best Shredder figure I've ever owned. Hyperbole? Perhaps. But it likes great in my collection and he has a great pose. Slimer seems to be the most popular Funko amongst geeks mainly for his slime stand, so I'm thrilled to finally own him. 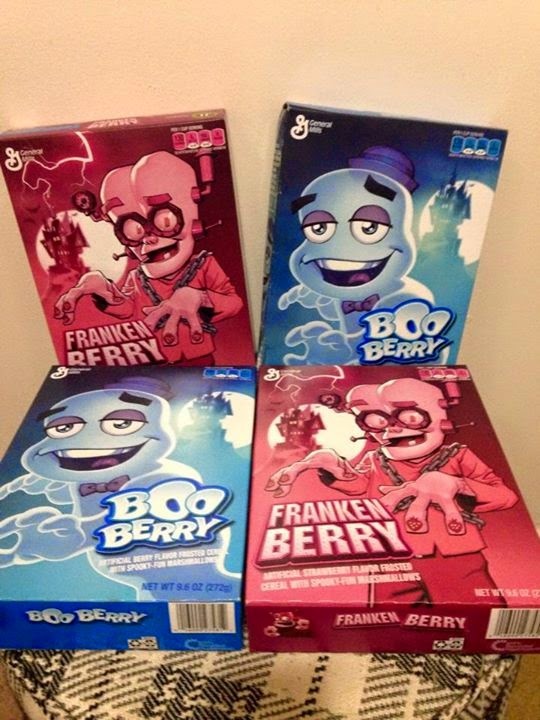 I don't know how, but my girlfriend's parents found 4 boxes of Frankenberry and Boo Berry. There's no real words I can use to explain my joy over these. MR.T BE SOMEBODY OR BE SOMEBODYS FOOL!!!! I received a lot of other great things but I simply could not let this year go by without sharing these cool pop culture relics. Hope you enjoyed! And don't forget to check out the DinoDrac Christmas Fallout as well as my buddy Nick Meece's Christmas Fallout as well! Looks like everyone made out pretty good! In fact, I'd say everyone I've spoken to had a pretty enjoyable Christmas as well. I'd love to hear what you got under your tree as well! Socks? Toys? Toxic Avenger set? Sound off in the comments! Been meaning to pick up that Saw bluray collection. Great haul! 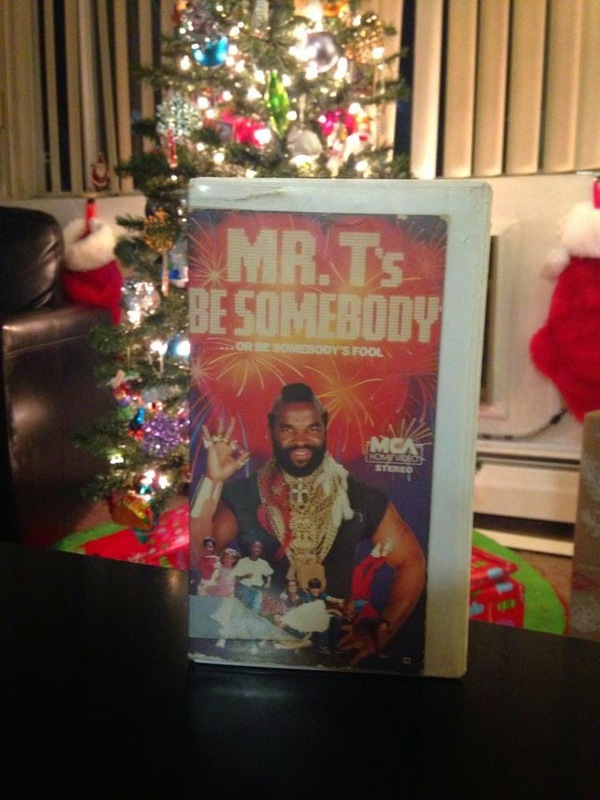 It's okay to buy yourself a lil something at Christmas - especially if it's Mr. T-related! Silent Night Deadly Night 2 Fan Commentary! Return of the Loot Crate!